Business owners who have just been introduced to the cloud are typically eager to know more about cloud accounting. This is a normal reaction when you realize firsthand the potentials of cloud technology in reducing your business costs and making your accounting operations easier. But are you really prepared to take on cloud accounting? There are a lot of facets in your business operations that may require the assistance of online tools. Processing sales and inventories is among these. One of the recent developments in finance and accounting is the integration of sales and inventory management tools with your cloud accounting system. This way, you can easily input the results of your sales and inventory into your books. Not all business owners who are using cloud accounting are familiar with cloud technology. For this reason, one of the top trends in finance and accounting today are cloud accounting systems that are easy-to-use. 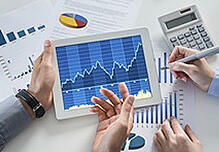 User-friendly functionalities in cloud accounting tools cut the time spent on tinkering with this accounting software. Easier collaboration comes with the ability to share files and collaborate easily with your accountant. As such, one of the “it” factors in finance and accounting today is the efficient sharing of files with their accountants. The cloud accounting tool Xero makes sharing of files easier by using the Excel format so that clients can easily upload their files on Xero. In the past, reconciling your bank documents with your invoices means manually inputting data to make sure that both accounts are matched. The popular practice today calls for the automated reconciliation of bank feeds through the use of cloud accounting tools. MYOB, Xero and QuickBooks all have this feature. A number of American small businesses have transactions with offshore suppliers. In some instances, they might need to issue checks in foreign currencies or convert cash to a different currency. To make this easier, some cloud accounting tools – Xero, MYOB and QuickBooks – offer multi-currency functions. This enables business owners to transact with foreign clients and suppliers more efficiently. Patronizing cloud technology brings a wealth of convenience at your fingertips. But to make the benefits of cloud technology work to your advantage, you need to keep up with the latest on cloud accounting. For more cloud technology updates – especially on the use of cloud accounting tools such as Xero, MYOB, and QuickBooks – get in touch with us here.